UPDATE: There’s a much easier method to accomplish this, and the method works for virtually any monitor. – Download the Custom Resolution Utility (CRU) from this thread. 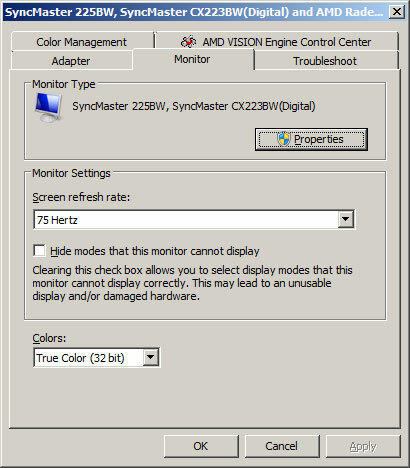 If you’ve reached this post, you’re probably wondering how to get your 225BW monitor to hit 75Hz at the native resolution of 1680×1050. Normally, it seems you can’t get 75Hz unless you drop the resolution to 1280×1020, which seems silly considering it’s not a native resolution, and it’s not a widescreen resolution. – The Samsung 225BW monitor driver, available here. – A video card with HDMI output. I’m using an AMD 6870, but I think this would work with NVIDIA cards also. Now, I got this working on Windows 7 Pro 64-bit, but again, I think this would work with Windows Vista 32/64-bit and also the 32-bit version of Windows 7. First, attach the adapter to the back of the monitor onto the DVI port. This part is pretty simple since the adapter can only go on one way. Once you have the adapter on, go ahead and connect the HDMI cable from the adapter to the HDMI output on the back of the video card. If you don’t see a picture on the display, you might need to reboot your PC for the video card to recognize that it’s outputting video via HDMI. Now, once you have a picture on the display, run the Samsung driver installation utility. It will ask if you’re installing it for the VGA (analog) port or DVI (digital) port. We’ll want to select the Digital port since that’s the adapter we’re using. Click to install the driver and I would reboot your PC just in case. This should be all there is to it. Now you can go to your display properties (in Windows 7, right-click your desktop, click Screen resolution, then Advanced settings, and finally click the Monitor tab) and you should be able to select between 60 and 75Hz. Now enjoy smoother mouse movement, smoother video playback, and smoother gameplay. One nice perk is that you can disable vsync in games without getting as much screen tearing as the standard 60Hz causes. Leave a comment below if this was helpful or if you have any questions.